What beliefs do Chinese learners hold about language learning? What is the effect of these beliefs on their autonomous learning? These are the two questions that this study aims to address. I employed naturalistic inquiry (Lincoln & Guba, 1985) to investigate five Chinese ESL learners’ beliefs about language learning and their learning behaviour. A number of instruments (interviews, classroom observations and stimulated recall, learning logs) were used to collect triangulated data over a 12-week period. Following standard procedures of qualitative data analysis, I identified five categories of learners’ beliefs. The results revealed that the beliefs that the learners held were context-specific, reflecting their learning experiences. Some of them were conducive to learning autonomy while others were not. The beliefs influenced the level of the learners’ autonomy. The study suggests that educators should take into account learners’ beliefs when promoting autonomous learning. Littlewood (1996) defines an autonomous person as “one who has an independent capacity to make and carry out the choices which govern his or her actions” (p. 428). The definition highlights two important aspects of autonomy: 1) learners’ ability to take charge of their own learning; 2) their independence in decision making, that is, they are able to regulate their learning without relying on others, e.g. teachers. But when operationalizing the construct, a question needs to be answered: to what extent is a learner expected to take control of their learning in order to be regarded as an autonomous learner? Nunan (1996) posits that “it [autonomy] is not absolute, but rather a relative concept” (p.26). Littlewood (1999) concurs, arguing that autonomy is a matter of degree. He distinguishes two levels of autonomy: proactive and reactive autonomy. The former “affirms [learners’] individuality and sets up directions in a world which they themselves have partially created.” (p.75). In this level of autonomy, learners take partial or total ownership of many learning processes which have been traditionally regarded as teacher responsibilities, such as deciding on learning objectives, selecting learning methods and materials, and evaluating progress. Reactive autonomy, on the other hand, ‘does not create its own directions, but, once a direction has been initiated, enables learners to organize their resources autonomously in order to reach their goal.’ (p.75). For example, learners go through past examination papers using their own initiative and learn vocabulary without being pushed. Littlewood (1999) points out proactive autonomy is regarded as ‘the only kind that counts’ when the concept is discussed in the West. 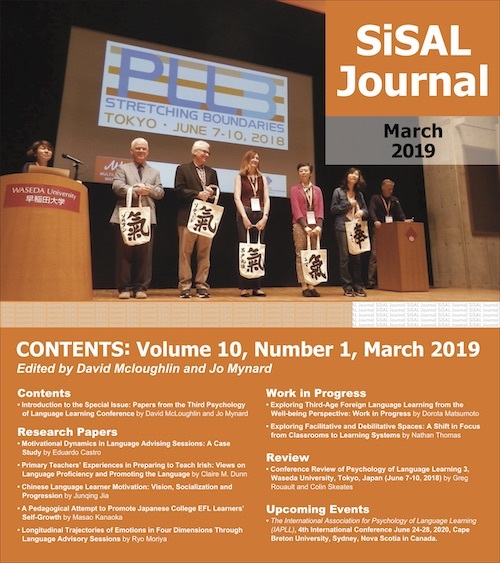 He argues that it is also useful to consider reactive autonomy either as ‘a preliminary step towards the first or a goal in its own right’ (p.75), particularly for learners in East Asian contexts. In this paper, I examine the notion of the learners’ autonomy and their level of autonomy in light of Littlewood’s framework. 1. What beliefs do Chinese learners hold about language learning? 2. What is the effect of the beliefs on their autonomous learning? In other words, do the beliefs promote or hinder their learning autonomy? (1) Interviews: I conducted two open-ended interviews, one at the beginning and another at the end of the study. Each interview lasted around one hour. Participants were provided opportunities to articulate their thoughts on a set of questions tapping into their beliefs about language learning and their learning behavior. For example, one of the questions that I asked was this: “In your view, what is the best way to learn English?” The purpose was to uncover their beliefs about their approaches to language learning. (2) Learning logs: I asked the participants to write one or two entries of learning logs each week, relating anything about their learning, e.g. their class activities, the role of teachers, their learning activities etc. (3) Classroom observations and stimulated recall: I observed and video-taped the learners twice in their intact classrooms to collect data on their class behavior. Each observation lasted 90 minutes which was then followed by stimulated recall where learners watched pre-selected video clips and commented on what was happening in the classroom, what he or she was doing at that time and why (Gass & Mackey 2000). Standard procedures of qualitative data analysis (Lincoln & Guba, 1985; Patton, 1990; Strauss & Corbin, 1998) were followed. I started with open coding the set of data for the first learner. This involved affixing codes to the units of analysis in the data which could be single words, short phrases, complete sentences, utterances or extended discourse. The open coding was then followed by category construction where I grouped the codes denoting similar themes or concepts into tentative categories. They were then tested against the second set of data for case two to see if the tentative categories existed and held up. When new tentative categories were identified, I would re-examine the previous case and added the new provisional categories to the subsequent data analysis. The recursive process continued until all the data had been analyzed and saturation point had been reached, i.e. there was no more new information or insights forthcoming. During this process, some categories remained while others were added, collated or renamed. In the end, five categories of beliefs emerged from the data. Tests can detect what I am clear about and what I’m not so sure of. If I made mistakes in the exams, they would leave a stronger impression. Next time I won’t make the same mistakes again. The significance that the participants placed on the role of exams may arise from their previous learning experiences in China where exams were usually high-stake. In other words, the test results played a vital role in their lives. For instance, they were used as the criterion for admission into university, applying for jobs and career promotions. Although they were in New Zealand, the influence from their previous learning still came into play. They reported responding to the test demands on the course and relying on tests as an external incentive to motivate them to learn and to provide feedback on their learning progress. Because exams decided the direction of their learning activities, I regarded their learning autonomy as reactive. I don’t think exams have a lot of impact on my learning in New Zealand. They don’t affect my entrance to university or jobs… I learn at a pace that suits me…I don’t change my learning behaviour due to the demands of exams. (Fei, Int II). Exams provide very important evidence for my progress, there are many other ways. For example, if I don’t look up new words as often after reading for a while, I think this is a progress. (Fei, Int I). Apparently, Fei changed her belief about the role of exams in her learning in the new learning context. Exams were not the drive in her learning anymore. On the contrary, she was in control of her own learning. She knew how to plan and evaluate her learning. Her learning behaviour was not reactive anymore but proactive. Rubin (1975) lists one of the features of good language learners is their willingness to live with a certain amount of vagueness and their willingness to make mistakes. Cotteral (1995) also points out central to good language learning was learners’ willingness to take risks, a behaviour which may not be as important in other school subjects, e.g. Maths or physics. The corollary of these learners’ concerns for accuracy was the attention they paid to grammatical features of English. This may lead to their neglect of the communicative function of the language and their high expectations of teachers to impart the correct knowledge to them. 3. Beliefs about their own effort. You have to work hard. If you don’t work hard, external factors can’t change your situation. During this process of self-regulated learning, most of the learners demonstrated proactive autonomy, that is, they made independent decisions about their learning objectives, learning methods and self-assessment. 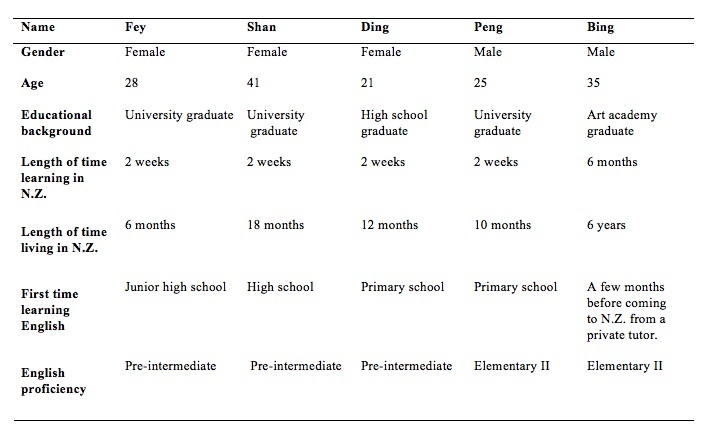 Gan’s study (2009) compared students from the mainland and Hong Kong also found that the mainland students use more self-directed strategies, which he attributed to their institutional context and social environment, e.g. under-resourced teaching staff and teaching facilities. It appears that the learners expected their teacher to take charge of their learning. Their beliefs about the importance of their own effort and the role of teachers were clearly in conflict. How could they emphasize their own effort on the one hand and yet expect their teachers to take responsibility for their learning on the other hand? The paradox can be explained if I trace the source of the conflicting beliefs. Most Chinese learners grow up with the value that diligence is a virtue, which is inculcated at home, at school and in the society. Working hard is a desired social behaviour. There are many sayings in China about the value of hard work, for instance, “constant grinding can turn an iron bar to a needle.” The role of students is to work hard using the resources they have been given and to persist in pursuing the goals that have been set for them, mostly by their parents, relatives or teachers. On the other hand, teachers have been held in high esteem in the Chinese society. Teachers of today may not hold the same status as is reflected in such an ancient saying as “He who has taught a person for a day deserves the same respect as his or her father for a lifetime.” However, the traditional views of teachers are still deeply seated in the Chinese society. Along with the reverence for teachers come the high expectations of teachers. They are expected to set a good example and to teach and build the moral characters of students. Their responsibilities for their students go beyond the curriculum requirements. For example, they also include the pastoral care of their students. In such social context, learners were barely given opportunities to make independent choices regarding their learning objectives and resources, which was taken for granted to be their teachers’ responsibility. Learners were not expected to manifest proactive autonomy but they had to demonstrate a high level of reactive autonomy. In China, teaching is regarded as more than a job. It comes with solemn responsibilities. Teachers think for their students as to what to do outside the classroom and how to help them pass exams. In New Zealand, teachers don’t think about this for their students. Teaching is just a job for them. In this regard, Fei was entirely self-directed. She demonstrated a high level of proactive autonomy. A noticeable change among the learners was their self-efficacy belief. Self-efficacy is a construct that originates in the work of Bandura (1977a, 1997). He defines perceived self-efficacy as “beliefs in one’s capabilities to organize and execute the courses of actions required to produce given levels of attainments” (Bandura, 1998, p.624). In this definition, it is clear that self-efficacy deals with personal judgements about one’s control over behaviour itself. Therefore, self-efficacious language learners will be equally autonomous as they are confident about their ability to control their learning and take actions. Table 2 compares the learners’ perceived self-efficacy at time 1 and time 2. It shows that the five learners’ perceived self-efficacy about learning English varied at time 1. While Peng and Fei were very confident about their abilities to learn English, Bing, Ding and Shan held a low self-efficacy belief about their capabilities. Their levels of self-efficacy ranged between 3 and 4. The interview data provided some insights. Bing’s low self-efficacy seems to be related to the belief that “I don’t have good memory” (Int I). Shan also believed that poor memory constituted a major barrier in her language learning. In addition, she considered herself to be lacking in perseverance. She was not sure ‘if I can persist with my learning to the end’ (Int I). Finally, Ding considered herself to be ‘very low’ in aptitude. She did not believe in herself and relied on teachers to give feedback on her progress and asked her friends to help with her homework. Now I’m completely different. I know better about myself. I know which skills I am good at and which I am not. Although I am still not very clear [about grammar], I have my own opinions now. Shan’s self-rated confidence about learning English shifted from 4 to 8. She did not ‘feel English difficult to learn anymore” (Shan, Int II). Her “motivation to learn has been boosted” (Shan, Int II). She believed “If I work hard, I can handle it [English]” (Shan, Int II). It seems when learners see some tangible changes after comparing where they were before and where they are now, they become more motivated to learn and their confidence about their ability increases. This suggests that language proficiency enhances the learners’ self-efficacy and autonomy. The finding suggests when students perceive themselves as competent and capable, they are most likely to learn autonomously. That is, they tend to plan, monitor, and participate in their learning. They may be more likely to persevere in face of obstacles in learning and achieve in their future learning. This paper reported on a qualitative case study investigating the effect of the learners’ beliefs on their learning autonomy. It identified five beliefs that the learners held about the role of exams and teachers, about the importance of their own effort and accuracy and about their self-efficacy. These beliefs were constructed in the social and learning contexts the learners had been in. Some of them were more conducive to autonomous learning (e.g. effort and self-efficacy) while others were not (e.g. the role of teacher and importance of accuracy). These beliefs were very complex and sometimes were contradictory. For instance, their beliefs about the role of teachers were at odds with those about the importance of their own effort. Furthermore, the beliefs that the learners held played a significant role in their learning and influenced their learning autonomy. The study also revealed that the learners varied in their level of autonomy. While Fei’s autonomy at both times was predominantly proactive, the other learners were initially more reactive. However, at time 2, they also showed an increase in proactive autonomy. This variation and development appear to be related to the different beliefs they held about language learning. The findings suggest that it is essential to understand the beliefs that learners hold about the different aspects of their language learning and the extent to which learners’ behaviour is influenced by these beliefs. This understanding can help teachers promote learner autonomy and avoid misunderstandings between their intention and learners’ interpretation. In order to be aware of their learner’s beliefs, teachers should encourage their learners to express them overtly. This can be done by asking them formally (e.g. with interview questions) and /or informally (e.g. at the end of a class activity) (see Barkhuizen, 1998, for details). Once they have become aware of their learners’ perceptions, teachers can plan and implement more effective strategies aimed at fostering learner autonomy. I feel indebted to my supervisor, Professor Rod Ellis, for his insightful comments on some ideas of this article and also to the two anonymous reviewers for their invaluable feedback and suggestions. Qunyan Zhong is a lecturer at Unitec Institute of Technology, New Zealand, teaching English as an additional language to adult immigrant learners. She holds an MA in Applied Linguistics and also an MA in Linguistics. Currently she is at the last stage of her doctoral study. She has been teaching ESL for over 10 years and her research interests are learner beliefs, learning strategies, and classroom research and SLA. Argyris, C., & Schon, D. A. (1974). Theory in Practice, Increasing Professional Effectiveness. San Francisco: Jossey-Bass. Bandura, A. (1977a). Self-efficacy: Toward a unifying theory of behavior change. Psychological Review, 84, 191-215. Barkhuizen, G. P. (1998). Discovering Learners’ Perceptions of ESL Classroom Teaching/Learning Activities in a South Context. TESOL Quarterly, 32(1), 85-108. Gan, Z. (2009). ‘Asian learners’ re-examined: an empirical study of language learning attitudes, strategies and motivation among mainland Chinese and Hong Kong students. Journal of Multilingual and Multicultural Development, 30(1), 41-58. Gass, S. M., & Mackey, A. (2000). Stimulated Recall Methodology in Second Language Research. Mahwah, New Jersey: Lawrence Erlbaum associates, Publishers. Nunan, D. (1996). Towards autonomous learning: some theoretical, empirical and practical issues. In R. Pemberton, S.L. Edward, W.W.F. Or, and H.D. Pierson (Eds. ), Taking Control: Autonomy in Language Learning. Hong Kong: Hong Kong University Press. 13-26.